The 14.5km Thames & Medway Canal was conceived as a wartime route for supplying military and naval bases without putting to sea, where ships would be vulnerable to attack. However, by the time it was completed, the wars were over. It was never a commercial success, but its tunnel between Higham and Frindsbury was the second longest canal tunnel in Britain. Later, the railways took over, and the tunnel was drained. Parts of the western half of the canal are still in water. During the late 18th and early 19th centuries, Britain and France engaged in frequent warfare. French ships were active in the Thames estuary and along the north Kent coast, posing a danger to English vessels supplying the British military and naval establishments on the river at Deptford and Woolwich, and on the River Medway at Chatham. In 1799, Ralph Dodd (c.1756-1822) proposed a canal cutting across the Hoo peninsula of north east Kent, from the Thames at Gravesend to the Medway at Strood. Cargo could be shipped directly between the towns without having to take a perilous journey from the Thames, past the sandbanks of The Nore, round the Isle of Grain and into the Medway — a round trip of 75km. Initially Dodd's 14.5km route consisted of an 11.1km open canal, 14.6m wide and 2.1m deep, and a tunnel 3.4km in length. He estimated it would take two years to build and cost £24,576. In 1800, he suggested a shorter route with a deep cutting 1.8km long, and revised the estimate up to £45,972. John Rennie (1761-1821) confirmed the line of the route, but advocated a tunnel instead of a cutting, raising the estimate to £57,433. An Act for making and maintaining a navigable canal from Gravesend to the River Medway was passed in Parliament on 16th May 1800, and work commenced the same year. The Act also incorporated the Thames & Medway Canal Company, conferring power for the company to raise £40,000 by offering shares for £100 plus £20,000 by mortgaging the works if required. At the Gravesend terminus, curved seawalls flank the entrance to the tidal river lock. The brick-lined lock chamber is an unusual barrelled shape in plan, though the curves are not symmetrical. Speculation on the reasons for using a reverse arch includes the idea that it's designed to match the hull curvature of ships, or to prevent the build-up of silt by encouraging scour by the incoming tide. The chamber was closed by two pairs of timber lock gates framed in cast iron, with each pair operated manually by four winches. The southern pair — possibly both pairs originally — includes a cast iron balustraded walkway along the top. The tidal lock opens into a canal basin, excavated in chalk. The basin to the east of the lock is reported to be paved with brick, apparently marking its original extent. The basin west of the lock has no paving but may have a puddled clay lining (now covered by a thick layer of silt). Parts of the basin, where the chalk was sound, to the west and south, had no side walls originally. Elsewhere walls of brick with stone coping were constructed, 1m thick or more, some battered and some vertical. The eastern end of the basin narrows into a lock between the basin and the canal (now infilled). In 1801, the canal was completed from Gravesend to Denton Marshes (TQ664741). In 1802, Dodd was dismissed and was succeeded by John Rowe, though nothing is known of Rowe's contribution to the project. By now, some 6.4km of level canal had been constructed, finishing north of Higham. Its trough tapered from 15.2m wide at the top to 8.5m wide at the bed, and contained water 2.1m deep. In 1803, Ralph Walker (1749-1824) surveyed the canal. To complete the route to Strood meant passing through or around the hard chalk ridge at Higham. Walker proposed a slightly shorter route than Dodd’s, omitting the tunnel and laid level in cuttings up to 30.5m deep. His estimate for the revised line was £98,147. On 5th June 1804, a new Act to vary the line and raise more money was passed. However, Walker’s suggestions were not implemented, and in 1808 he resurveyed the route. This time he recommended a line some 2km shorter with a long tunnel at Higham, at a cost of £54,704. A further variation Act was sought, and granted on 18th May 1810. Changing alignment and pursuing the necessary Acts of Parliament had depleted company finances. Construction stalled. In 1817, William Tierney Clark (1783-1852) was appointed engineer and estimated that completing the works would cost £97,755. On 17th March the following year another Act was passed, giving the company powers to fund a further £100,000 from £50 shares, or through interest-bearing £100 bonds secured against company assets. In April 1819, tunnelling commenced. The 3.7km long straight tunnel (TQ717724 to TQ740697) was dug by hand through the chalk, which was solid enough not to require a brick lining. The chalk reflected the available light so well that, even in the middle of the tunnel, it was never totally dark in daylight hours. When completed, it was the second longest canal tunnel then built in Britain. It also had the largest cross section, and is elliptical in shape, 10.7m high from the canal bottom to the arch soffit and about 9m wide — capable of carrying a 6.9m wide vessel alongside the 1.5m towpath. Alternate sections of the bore were formed to either parabolic or circular curvatures, with the tops of the arches coincident more than 4.6m above the towpath. As the tunnel was only one vessel wide, barges travelled in one direction at a time according to a strict timetable. Waiting barges moored in basins at Higham and Frindsbury (both now infilled). Clark also designed a swing bridge (TQ675739) over the canal, north of Chalk. It is a timber structure with a cast iron counterweight, probably operated by hand. The bridge spans 7.3m between brick abutments, and is 3m wide between support posts and 3.65m wide over the span. In 1820, a granite obelisk (TQ710733) was erected on the east side of the canal near Higham, on the transport duty boundary between London and Rochester. Its inscription reads "This boundary stone marking the line of jurisdiction of the cities of Rochester and London on the Medway and Thames Canal was erected AD1820. The Worshipful John Gibbs Mayor of the city of Rochester". On 17th June 1824, yet another Act was passed to enable the company to realise more money and complete the canal. It authorised raising £50,000 in interest-bearing bonds of £1,000 each, with extra powers to raise a further £25,000 if required. On14th October that year, the canal finally opened, after a total expenditure of around £260,000. A convoy of barges traversed its length from Strood to Gravesend, and a formal dinner was held in Rochester. It was soon clear that the tunnel needed a passing place. A proposal to widen the centre of the tunnel to 15.2m, over a length of 61m, was too costly. Instead, in 1830, an open air passing place (TQ726713) some 138m long was created by excavating down to the tunnel from a low spot on the surface. The tunnel was cut in two, with the 1.4km Higham Tunnel to the north west of the passing bay and the 2.1km Strood Tunnel to the south east. However, the canal never attained its commercial potential — war with France was long over. By 1831, it was little used except during the hop picking season. Moreover, the canal bed leaked and the water level fluctuated with the spring tides. With the spread of railway transport, canals nationwide began to lose their place as traffic arteries and the Thames & Medway Canal was no exception. In 1842, John Urpeth Rastrick (1780-1856) met with the canal's shareholders to explore the possibility of converting the route into a railway. At some time between 1842 and 1844, it was decided to construct a railway along the south side of the canal, with the tunnels shared with boat traffic. On 8th February 1844, the Gravesend & Rochester Railway & Canal Company was created, with Rastrick as its engineer. Work commenced immediately, laying a new single track standard gauge (1.435m or 4ft 8.5in) railway from Milton, near Gravesend, to Strood. The Railway Chronicle for 1845 reported that Major-General Charles William Pasley (1780-1861, knighted in 1846), inspector general of railways for the Board of Trade, had "tried the security of the tunnel by the firing of cannon, to ascertain whether the chalk would fall, or the roof required bricking". No falls occurred and the tunnels were judged sound, though Pasley did advise installing a brick lining to certain stretches. The track through the tunnels was supported partly on the towpath and partly carried on timber staging fixed into the canal bed. On 30th December 1844, the railway company’s directors took their first journey on the new 11.2km Gravesend & Rochester Railway. The line opened on 10th February 1845. Canal barges were towed through the tunnel by steam tugs as the towpath was no longer available for use by horses. On 31st July 1845, royal assent was granted for the Gravesend and Rochester Railway and Canal Act to raise more money and "widen, extend, and maintain" the railway alongside the canal. Under a further Act, passed on 16th May 1846, the railway was sold to the South Eastern Railway Company for £310,000. In July 1847, the company received authorisation for doubling the tracks. The Higham and Strood tunnels were drained and their canal troughs infilled, and the tunnel walls were cut back and lined with brickwork to make the bore wider. The remaining length of canal, from Gravesend to Lower Higham, was still in use. Some time before 1869, a drawbridge was constructed over the tidal lock of the Gravesend basin. By 1897, it had been changed to a swing bridge — with a riveted cast iron flat-arch superstructure, timber decking and cast iron handrails. It's operated by a cable and drum, with a cast iron windlass on a three-legged pedestal, on the quay just south east of the bridge. In 1934, the canal was formally abandoned between Gravesend and Lower Higham. Its route survives largely intact, though heavily overgrown. The northern river lock gates at Gravesend were destroyed by a random bomb strike during World War II (1939-45) and have not been replaced. Rubble from bomb damage in London was used to infill parts of the canal. During the late 1960s and early 70s, the lock at the east end of Gravesend basin, leading into the canal, was infilled, as was the canal from the lock eastwards to Denton Marshes. In the 1970s, the swing bridge was rebuilt as an exact copy of the original but continued to be operated with the existing hand-cranked winches, now cased for safety. The southern lock gates were replaced by a pair of 10 tonne steel mitre gates. Access through the gates, no longer a lock, to the basin is possible only at High Water (Tilbury). In 1973, the lock cottages next to the canal basin were demolished. However, in February 1976, the Thames and Medway Canal Association was founded, with the aim of restoring the canal and returning it to the national waterway network. Over the years, some £1m of restoration has been carried out, including vegetation clearance and the installation of a pump. On 27th April 1983, the Gravesend swing bridge re-opened after restoration. Its roadway, 2.3m wide between kerbs, carries a 5 tonne weight limit. In 1986, the canal basin at Strood was filled in and later built over. Between 1990 and 1995, the swing bridge near Chalk was refurbished by Network Rail. In January 1996, the obelisk boundary marker was Grade II listed. In the late 20th century, parts of the south bank of the Gravesend basin were strengthened with concrete and sheet piling, when the Central Electricity Generating Board built a three-storey regional headquarters here (now in residential use). On 18th January 2004, after long-term drainage problems, rock falls and the imposition of speed restrictions in 2000, the Higham and Strood tunnels were closed for re-lining and strengthening. They re-opened on 18th January 2005, with a speed limit of 112.6kph (70mph). The railway line through them remains in continual use. In 2005-6, Gravesend canal basin was dredged and the lock’s southern gate timbers replaced. The basin is now known as The Embankment Marina and is used by leisure craft. In September 2010, the Gravesend barrelled lock chamber, sea walls, swing bridge, locks and canal basin were all Grade II listed. The canal is a rarity — one of very few canals constructed in counties south of London. In 2011, the roadway over the Gravesend basin swing bridge was closed to traffic to preserve the structure, though it has a Kent County Council licence for use by "pedestrians and horse drawn vehicles". It’s likely that it was refurbished at the same time. In 2014-5, the timber swing bridge north of Chalk was restored to operational condition by the Thames and Medway Canal Association. It had not swung open since 1995. In March 2015, the first narrowboat in 80 years was launched from the slipway at Gravesend into the canal basin. 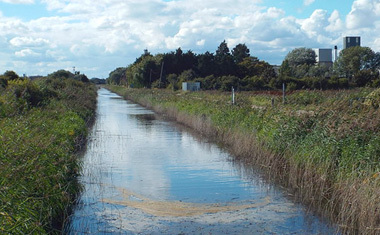 Apart from Gravesend basin, the canal is mostly in water — though disused — from Denton Marshes to the north end of Higham Tunnel, with the exception of a blocked stretch between Chalk and Queen’s Farm (TQ696767). Thames & Medway Canal is also known as Gravesend & Rochester Canal.